I am working on a project involving bluetooth and wifi communications. Both of them are wired up to the Arduino and communicate to it using two software serial port. The scenario is the one in the picture attached. 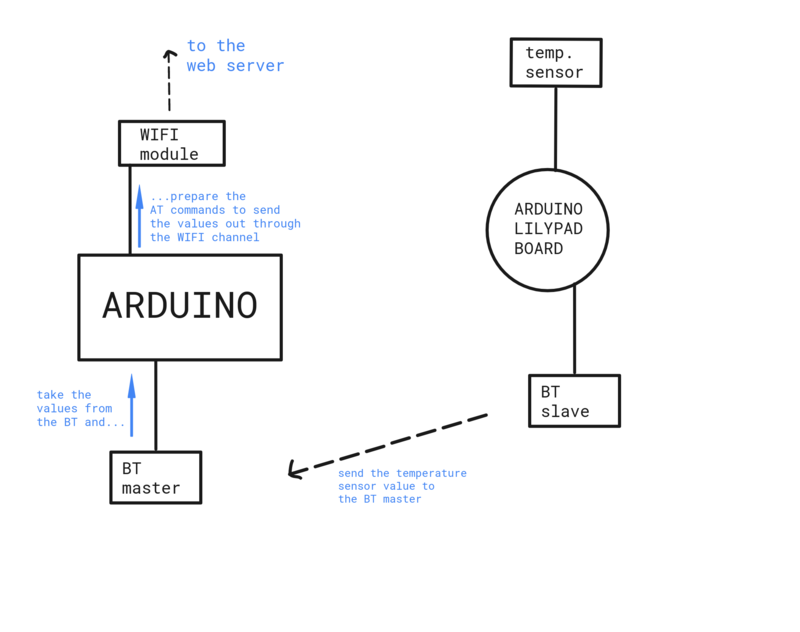 take it and send it, using AT commands, through the WIFI channel (the WIFI module is a ESP8266-01) to a web server. The problem is that if I start listening to the BT serial port (BTSerial.listen()) I am not able to properly send the sensor values through the WIFI connection. 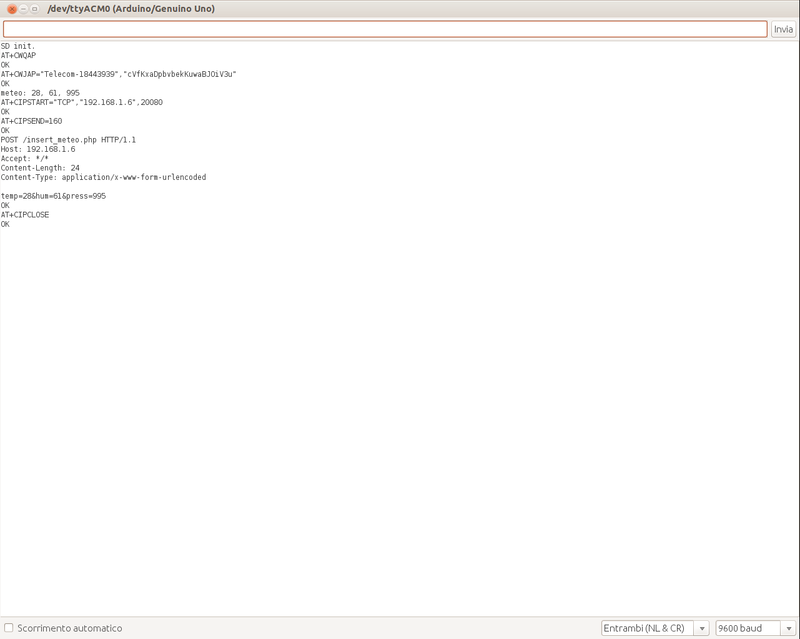 But if I comment out the lines related to the BT sotware serial, and try to send fixed value to the web server, the sending terminates succesfully. In my opinion there are some problems with the BTSerial.listen() and WIFISerial.listen() calls, since they are not able to switch from one the the other correctly. I saw the TwoSerialPort example provided into the Arduino IDE and I tried to apply it into my code but it still not works to me. Does anyone have a idea which would be the problem? Does anyone already faced with this problem or a similar one? Hoping to be as much clear as possible, thanks in advance to anyone would help me. The problem is the code goes properly till the AT+CIPSEND command, then the POST request is sent but no good feedback arrives, ending with the "ERRORE" error message. [EDIT 2] Attached serial monitor output This is the serial monitor output when I execute the skecth. It seems to work properly but it does not upload any value. Use the HardwareSerial port (i.e., Serial) for one of the devices. You can still use it for debug prints, as long as the device has some kind of command "format". For example, if commands start with "AT", just make sure that none of your debug prints start with "AT". It is the absolute best choice. You would have to disconnect RX pin 0 from the device in order to upload new sketches over USB. Use AltSoftSerial for the other device. It is the most efficient software serial port, and it can be used at the same time as Serial. It only works on two specific pins. NeoSWSerial is the next best choice, at limited baud rates. It can be used with the above choices, but transmitting on NeoSWSerial prevents them from receiving. SoftwareSerial is the worst choice. Receiving or transmitting on SoftwareSerial prevents all of the above from receiving anything. It disables interrupts for long periods of time. ... save them until '\n' arrives? ... then parse some values? Not the answer you're looking for? 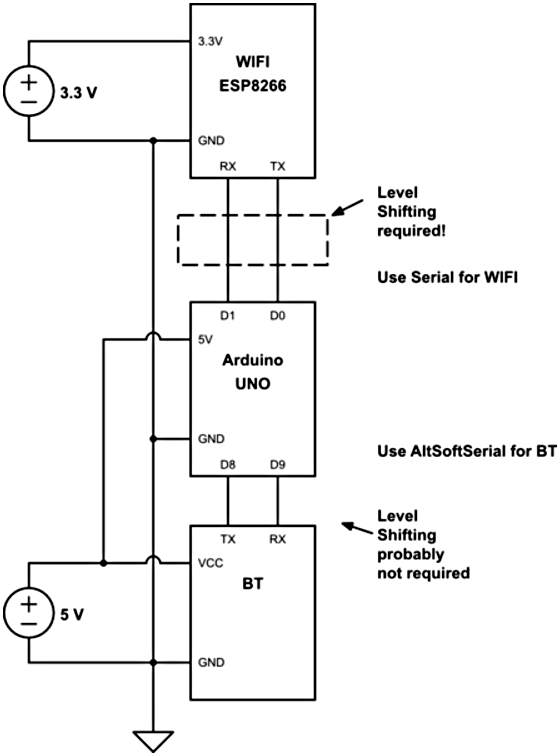 Browse other questions tagged arduino-uno bluetooth wifi softwareserial or ask your own question. What's the difference between all the Software Serial Libraries? Which one is Arduino Nano compatible? How do I send HTTP request using ESP8266 to other port than 80?